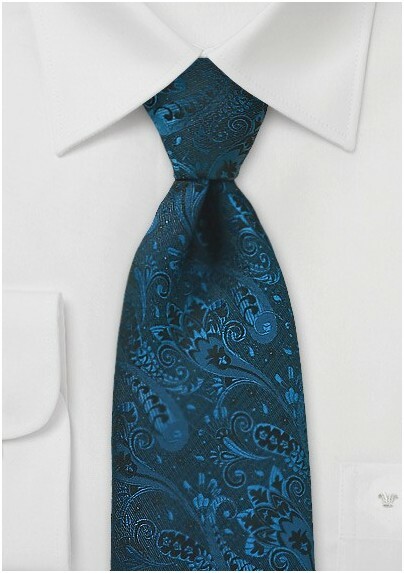 Add a element of regal opulence to your next menswear ensemble with this modern and savvy paisley patterned tie in inky shades of teal and black. The beautiful hue of teal is a versatile accent color that pairs beautifully with dark toned menswear neutrals. 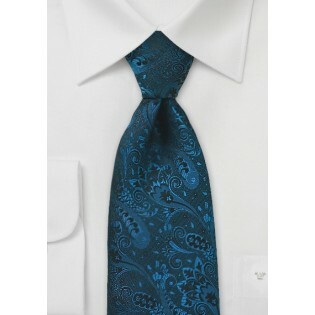 Take your black suits and black blazers to the next level with this splendidly designed necktie. This tie is designed by the Chevalier Design House and is crafted from a premium silk and shimmers and glistens with masculine good looks.